The Things I Said I'd Never Do: My Favorite Dads! Fathers Day is an often neglected holiday and I think that's a shame. Mother's Day gets more hype but Fathers are so very important. I think the good fathers of the world deserve way more props than they are given. Here's a shout out to some of my favorite Dads. I'm struggling to come up with sufficient words to describe Brett as both a husband and a father. Awesome. Amazing. Incredible. Perfect. None of those words properly convey my feelings. Before Max was born, I didn't know it was possible to love Brett anymore than I did. I was wrong. Watching those two together is simply watching God at work. The way Brett helped me through the first dark weeks of Max's life, when I let depression take over, was humbling. He was so strong and supportive. He never complained even though I knew being a parent was a huge adjustment for him too. We came out of it a closer couple and better parents and he deserves all the credit. There is no one in this world that can make Max smile bigger than his Dad. No one has quite the right touch when playing "flying baby" and no one can make the correct sound effects during games of "broken elevator" and "dancing robot baby". Being a Dad is what Brett was made to do and it's been a blessing to witness him blossom into his role so seamlessly. I am absolutely the luckiest woman in the world. My Dad always put his family and his faith first. Despite working a demanding job he never missed a concert, recital or sports game. He even coached many of our teams, a fact I didn't appreciate when I was a snotty tween. Dad also always made sure that we attended Mass every weekend even if we protested fiercely. He lives his strong Catholic faith through actions and not words and his example helped me develop my relationship with God. I hope I can provide the same example to Max. My Dad is a brilliant storyteller and a genuinely friendly guy. I see him at parties and events making sure to talk to everyone in the room, especially the people he doesn't know. I think he talked to more of my wedding guests than Brett and I did. It's a trait I admire and try to imitate. He makes everyone feel welcome, even if he isn't even the host of the party! Watching my Dad meet and interact with Max has been one of my greatest joys. He loves both his grandsons so much and it kills me that Max is growing up so far from his Papa. Despite the miles he still makes sure to keep up with Max through pictures, text messages and phone calls. I know that Max will get to be close with his Papa even if he lives 800 miles away. I love you Dad. Thanks for always being there. Thank you for fostering my obsession love of Chicago sports and for teaching me how to pull off a great practical joke. Also, thanks for not killing me during my teenage years. He only looks like a mild manner dad and grandfather. Looks can be deceiving. He's a race car driving, flat track racing, aerobatic airplane flying, extreme sport superstar. Plus, he can build and/or fix anything! As I stated above, my husband is completely awesome so he obviously learned those awesomeness skills from somewhere! Watching my father-in-law with Max is so much fun. It's so obvious how much he loves his grandson. You have to pry the kid out of his arms for bed time or diaper changes! I am so lucky to have such a marvelous and supportive father in law. Watching Dan raise my nephew as a single dad is inspiring. He has overcome so many obstacles and fought tooth and nail for paternal rights in a mother-centric family court. 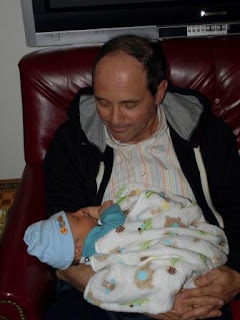 His whole life is devoted to his son Dylan.He works long hours to make sure he can provide the best for his son. Dan has been supportive of me as I struggle through the ups and downs of raising a young baby. I never thought my younger brother would help me with parenting!! It's an honor that he agreed to be Max's Godfather. Raising three young girls on his own? Admitting he needed help and allowing friend Joey and brother in law Jesse to move in (seemingly rent free)? Managing to always be cheery and positive even after working the tough gig as the co-host of "Wake Up San Fransisco"? How could you not love Danny Tanner? He's the ultimate TV Dad, always teaching his girls life lessons through situational humor. Plus, his commitment to cleanliness was impressive. I grew up wishing I could be part of the Tanner family. **I'm still traumatized from the first time I saw Bob Saget's comedy. A small part of my childhood died watching that routine. Very sweet, you made me cry! somehow i knew you were going to list Danny Tanner... i dont know why, but i said his name in my head before i read this. also, i didnt know that about your brother and that is so wonderful and inspiring (the last time i saw him i think he came up to our waists). hope you and brett had a great sunday in the south! Very sweet post! Thanks for coming by to visit on my SITS day! Hope you have a great week. Full House! Such a great show...I loved watching it as a tween.